Christchurch city promises an eclectic mix of historic elegance and contemporary culture. As the gateway to the South Island, it's a must on any itinerary. Christchurch is the perfect place to start your South Island road trip. Old English gardens contrast with pop-up bars, fine dining and container-based shopping malls in this eclectic centre. Favourite activities include punting down the Avon River, biking in the Port Hills, or taking a day trip out to the French colonial settlement of Akaroa. Spend a day or two exploring this vibrant city before heading inland through the patchwork fields of the Canterbury Plains to Lake Tekapo. With its stunning turquoise water, Lake Tekapo offers a so many ways to enjoy this part of the country – hiking, fishing or relaxing in hot pools while gazing at the lake. The road from Lake Tekapo takes you past beautiful Lake Pukaki. The opaque turquoise colour of this lake and others in the area is caused by fine, glacier-ground rock particles held in suspension. 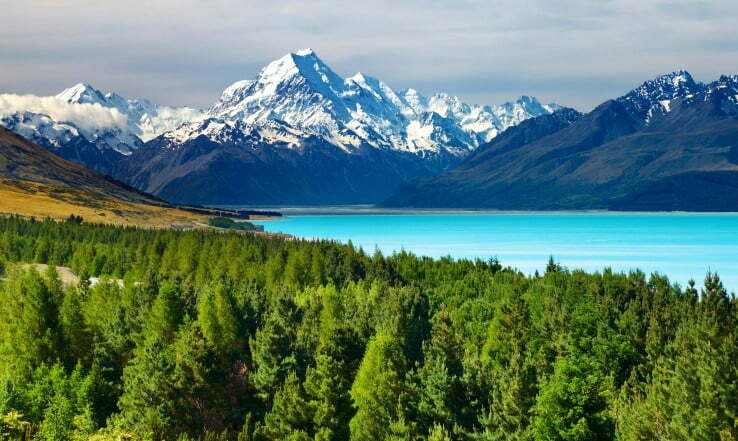 From here, head to Twizel to stop and explore the scenery and venture to Aoraki Mount Cook National Park to see the highest peak in Australasia (Mt Cook - 3755m). A lively town buzzing with a carefree spirit, Wanaka's picture-perfect location and easy access to the outdoors makes it the ultimate base for your holiday. Queenstown’s stunning scenery, huge range of activities and warm welcome are world renowned. Surrounded by majestic mountains and set on the shores of crystal clear Lake Wakatipu, the natural beauty and the unique energy of the region create the perfect backdrop for a holiday full of adventure, exploration or relaxation. Make sure you spend some time in the Gibbston Valley to savour the award winning food and wine options. It’s not far to Arrowtown, one of the most charming historic towns in New Zealand. Once a gold rush settlement, today it’s a perfectly preserved piece of the past. Explore the Chinese miners’ settlement by the Arrow River, pan for gold visit the Lakes District Museum, then find a convivial café to soak up the surroundings.